Addis Ababa (AFP) - Ethiopian Prime Minister Hailemariam Desalegn said Tuesday his government wants to reform an electoral system which has excluded the opposition, in response to months of bloody protests. Hailemariam met with German Chancellor Angela Merkel just days after declaring a six-month state of emergency following a protest movement against his one-party regime, which is accused of marginalising the country's largest ethnic groups. 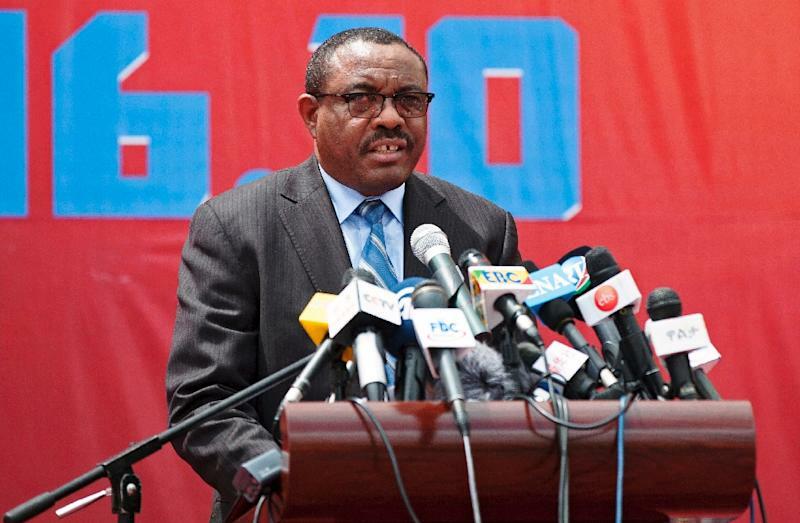 "We want to reform the electoral system so the voices of those who are not represented can also be heard in the parliament," Hailemariam said. "Because of this electoral system 51 percent of votes is enough to win all the seats." Under Ethiopia's current system, Hailemariam's ruling coalition took every one of the 546 seats in parliament during last year's election. His regime currently faces its biggest challenge in the 25 years since coming to power. When he succeeded Ethiopia's former Marxist rebel-turned-leader Meles Zenawi, who died in 2012, Hailemariam said he was committed to opening up the country's political system to allow more space for opposition parties. However international rights organisations regularly criticise his government for cracking down on dissenting voices, keeping a stranglehold on the media and intimidating the opposition during election campaigns. "Our democratisation process is still nascent. It's fledgling... We want to go further in opening up political space and engagement with civil society groups," said Hailemariam. Merera Gudina, chairman of the opposition Oromo Federal Congress, said Hailemariam's promises were "too little, too late". "We have been demanding this for several years. They are always promising things for the consumption of the international community but it's never implemented," he told AFP. "The people are demanding more than what can be done four years from now. They want fundamental changes: a transitional unity government where all stakeholders will be included." Merkel, who is on a three-nation Africa tour aimed at fighting terrorism and stemming the migrant influx to Europe, told Hailemariam that a "vibrant democracy needs opposition, it needs free media. People want to express their views". Since the state of emergency was announced on Sunday, Ethiopia has restricted access to internet, which is used by protesters to organise themselves. The country's Oromo and Amhara communities -- which together make up 60 percent of the population -- have been protesting for nearly a year against marginalisation by a government largely made up of minority Tigrayans, which controls power and the economy. Merkel called for "open talks" with the opposition and offered Ethiopian police training from the German interior ministry in the use of appropriate force. Rights groups say at least 500 protesters have been killed in a police crackdown on demonstrations. "I offered that we have a dialogue via our ministries of interior on how police can be trained so that not so many die when there are such riots," said Merkel. The protests, which first began in November 2015, threaten Ethiopia's reputation as an oasis of political stability, as well as its double-digit growth, a magnet for foreign investment. The latest surge in violence came after police fired tear gas at protesters attending an Oromo religious festival on October 2, sparking panic in a massive crowd and triggering a stampede that left over 50 dead. Protesters have turned their anger against foreign-owned companies, torching several farms, factories and tourist lodges in the past week.